I love bridal hair pieces and when I came across *Hope Bridal* I just adored the pretty handmade collection, perfect for vintage and boho loving brides. The intricate detail, delicate designs and beautiful embellishments in each piece is so impressive. Many of the pieces feature sparkle and pearls, which as we know are two of our favourite things at *Sparkle Pearls and Lace* and I love the charming gift boxes they arrive in. That really would be an exciting parcel to receive in the post! I really love that *Hope Bridal* offers a stunning range of bridal hair accessories that are creative, unique and a fabulous alternative to a traditional tiara. The sparkle and pearl encrusted bands and combs would be fabulous with an art deco or Gatsby inspired vintage wedding dress. Whilst the incredibly pretty, ethereal bridal halos and vines would be perfect for a rustic and boho loving bride. Accessorising with these gorgeous accessories would be a sure way to glam up your bridesmaids also! The lovely hair pieces are available to buy from the *Hope Bridal Etsy Shop* and bespoke orders can be made also. Dealing with numbers and computers every day in my professional life has led me to spending a lot of my personal time being creative. I love trying out new crafts and in the past few years have dabbled in card making, jewellery making and millinery. I wasn’t sure what my next venture would be until a family member suggested bridal tiaras. Although HopeBridal isn’t about traditional style tiaras, the principles are the same – we create beautiful headpieces for brides to wear on one of the most important days of their lives. Our headpieces and accessories are lovingly handcrafted in Scotland. We focus on attention to detail and make sure our brides receive the best possible service. We are great at communicating and working with brides to ensure we make them the perfect accessory! 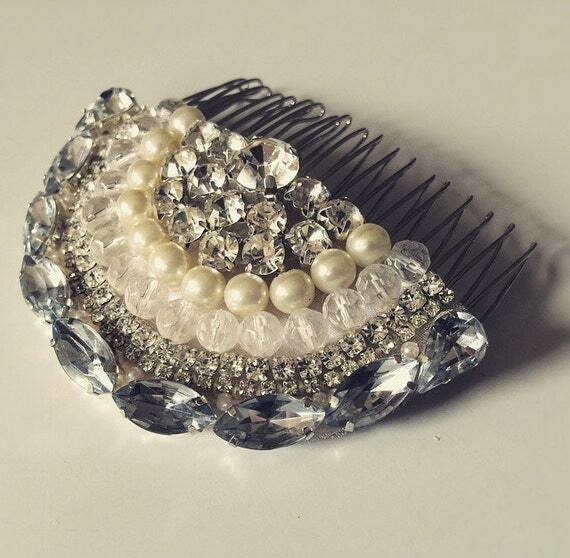 We offer a range of bridal accessories, from boho halos to vintage glam hair combs. As well as our lovely accessories, we offer excellent customer service and provide as much help and advice to our brides as we can. Oh, and we love to package our items beautifully too! We make elegant, boho style halos and hair vines featuring beads, jewels and charms. We also create vintage style jewelled headpieces. We’re always working on new pieces though and enjoy trying out new styles. We are happy to make bespoke items for our brides. However, we think it’s important to stay true to our own style and have elements of this shine through in all of our bespoke pieces. We use various elements to create our accessories. Our hair vines and halos are made from intricate wire work with an assortment of beads, jewels and charms. Our vintage jewelled headpieces are made by hand sewing elements to organza and then strengthening the piece using interfacing. We’re always considering new materials though and have even recently been scouting the beaches of South West Scotland in search for natural materials to use. Hopebridal headpieces are perfect for both brides and their bridesmaids. We can help brides choose bridesmaids’ accessories which will complement their own. We think our hair vines are a perfect accessory to wear at a summer festival. We’ve also had girls ordering sparkly cuffs to wear at Christmas parties. We make our items to order and our current lead time is 3~4 weeks. For brides having hair trials, we recommend taking your headpiece along with you to ensure everything works perfectly together. We can provide accessories to Brides across the U.K. and beyond. We’ve even created a hair vine for a boho bride all the way from Long Beach California! Brides looking to order from outside the U.K. can get in touch via our Etsy store for details of delivery. A huge thanks to the lovely Aimee of *Hope Bridal* for providing today’s *Pearls of Wedding Wisdom* and filling our day with plenty of sparkle!